I once got a beautiful black rabbit. When trying to come up with a name, my mother said if I named it “Licorice”, she would buy me licorice whenever we went to the grocery store. “Licorice” it was! I mean, how could I resist the thought of getting candy every time I went to the store? The thing was, I hated licorice. Not so much anymore – unfortunately, it is a bit late to make good on the offer of free licorice. Fennel is known for its exotic licorice flavor. As far as vegetables go, I think fennel is one of the most exciting ones around (if you remember this post, I mentioned my love and excitement). I just cannot resist it and am so in love with the beautiful, willowy bulb – really, I feel confident in saying I am enamored with fennel. 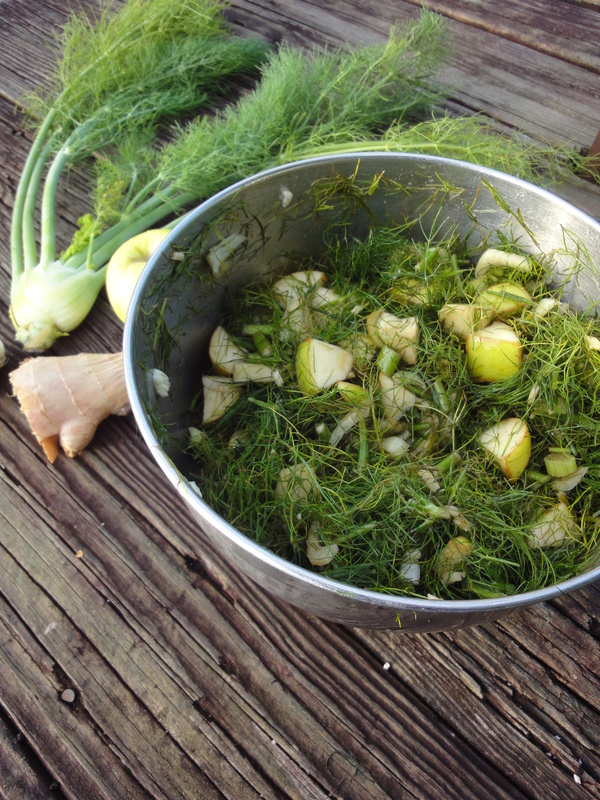 And the great thing about fennel is that no matter how you prepare it, it is delicious, both raw and cooked. Fennel is rich in vitamin A, as well as calcium, iron, magnesium, zinc, and vitamin C. For centuries, it was used for its medicinal properties (think kidney stones, gout, digestion, anemia just to name a few). This year, I decided to experiment in my garden and try planting it. And goodness, I am so thankful I did (even with fighting off a mole and attracting a swarm of Black swallowtail caterpillars. Who knew that fennel, along with other members of the parsley family, was a host plant for them? Lesson learned). My fennel bed is coming to an end, but not before I am able to enjoy a few last meals. Fennel is usually found combined with oranges in salad. However, I prefer using apples – especially with it being apple season and being able to get them local! 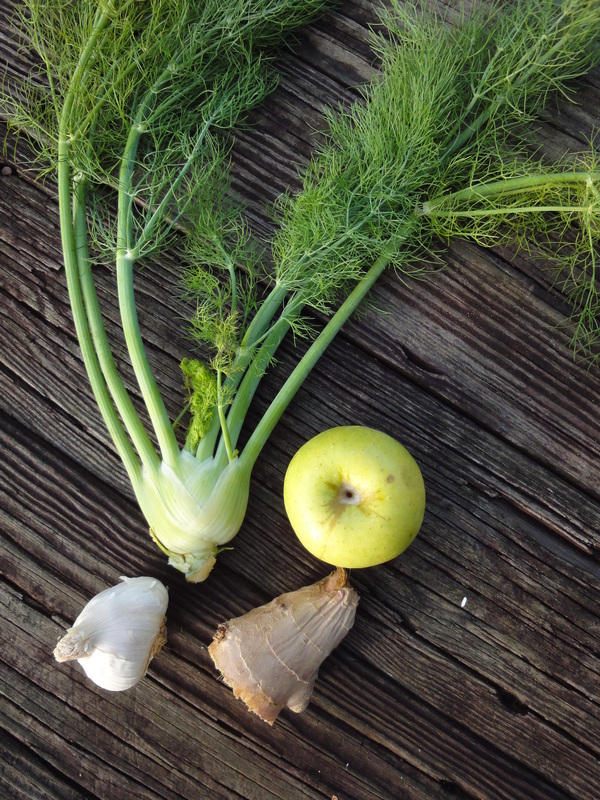 The sweetness of the apple pairs really well with the fennel and makes a delicious and refreshing salad. There is not much to this recipe. It is super easy and quick. Just a bit of chopping and mixing. Now, I will admit, I hate anything going to waste, so I use the WHOLE fennel. Every last part. However, the stems are definitely crunchy and each bulb tends to have a lot of fronds, or leaves. So feel free to just use a portion of the leaves with the bulb. And you might want to add more bulbs to the recipe if you omit the super crunchy stems. *You can use 1/4c olive oil instead of 2 Tbs of each oil. I love the minced ginger! But if you want to make it with an Italian flavor profile, omit the ginger and the sesame oil (replacing with olive oil). Add the last 6 ingredients in a bowl and whisk. Add the apples and fennel and toss. This is best when allowed to sit for the dressing to marinade the fennel and apples. I would chill it for at least 2 hours in the fridge, but it can be made a day ahead, as it is actually better the next day in my opinion. Caramelized Fennel and Goat Cheese Flatbread from My New Roots. Have not tried, but plan on making this or fennel casserole for dinner. Fennel casserole – There are tons of recipes for fennel casserole. I plan on trying it with a simple béchamel sauce. Tomato-Fennel Soup with Garlic Croutons and Parmesan Cheese from “Fields of Greens” by Annie Somerville – this was my go-to this summer when tomatoes were at their prime. Maybe not the simplest and quickest to prepare, as I used all fresh ingredients and had to properly prepare the tomatoes, but totally worth the effort. This is my favorite tomato soup! I am a dessert girl. Growing up, my father always wanted dessert after a meal. It is engrained in me to crave a bit of sweet to finish a meal – I take after him. Sometimes I am able to resist temptation, but most of the time, I give in. On a recent trip to Nashville, I stopped by the Franklin Farmers Market and picked up some peaches from The Peach Truck. 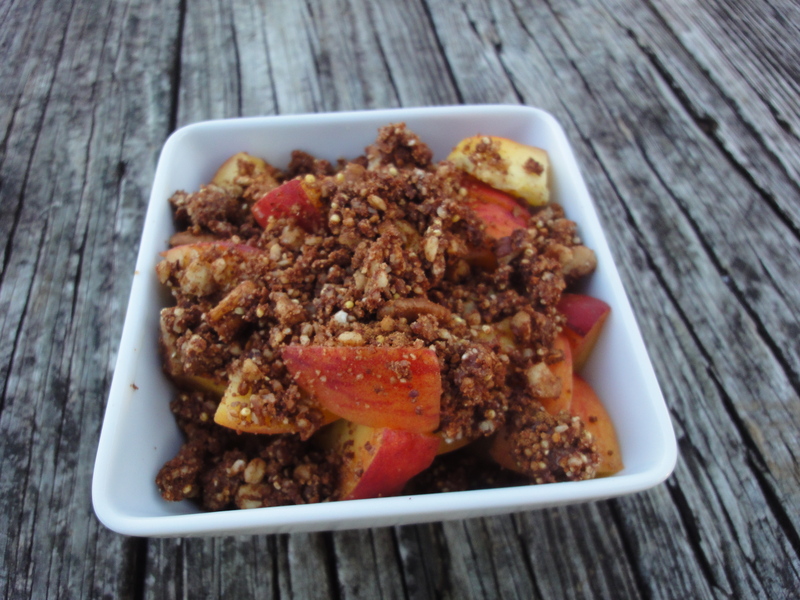 Although perfect for eating just as they were, I decided to make a raw peach crisp to satisfy my craving for dessert. Prep: just enough time to cut peaches, measure ingredients, and combine in the blender! Wash and slice peaches into bite size pieces. Combine the next 5 ingredients in a blender and pulse until almost ground – a crumb like consistency. Divide peaches into two bowls and pour topping over them. The great thing about eating raw is that cook time is minimal. All it usually takes to prepare a meal is some washing, chopping, and mixing (and occasionally some blending). 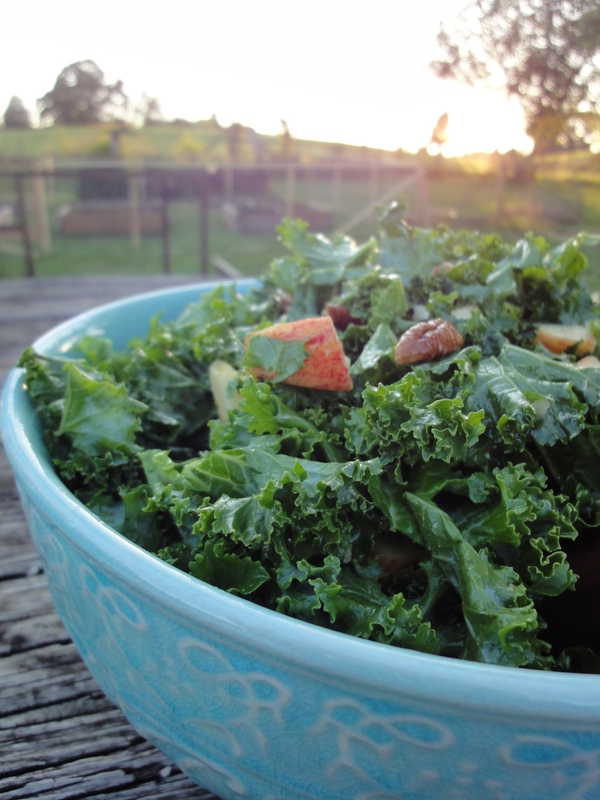 I love this kale salad and seem to make it once a week with all the kale I get from my CSA. Tear away the stems from the kale leaves and discard the stems. (We have chickens so “discarding” never seems like a waste, as they act as our compost bin.) Chop kale roughly into pieces. They just really have to be small enough to eat. Or if you prefer, you can slice them into thin ribbons. I personally like them a bit hefty. Chop the apple in to 1/2″ pieces. You can chop them matchstick style or diced wedges, whichever you prefer. I honestly do both. In a small bowl, combine all the dressing ingredients and whisk. Put the kale and the dressing in a large bowl and combine. I like to use my hands to massage the dressing. By “massaging” the kale, you aid in breaking down the structure of the kale so that it wilts, resulting in a less bitter taste. Add the remaining ingredients and toss. One of the great parts about this salad is that it is still great the next day. Even though it will definitely be wilted, it still tastes great as the flavors in the dressing only intensify. 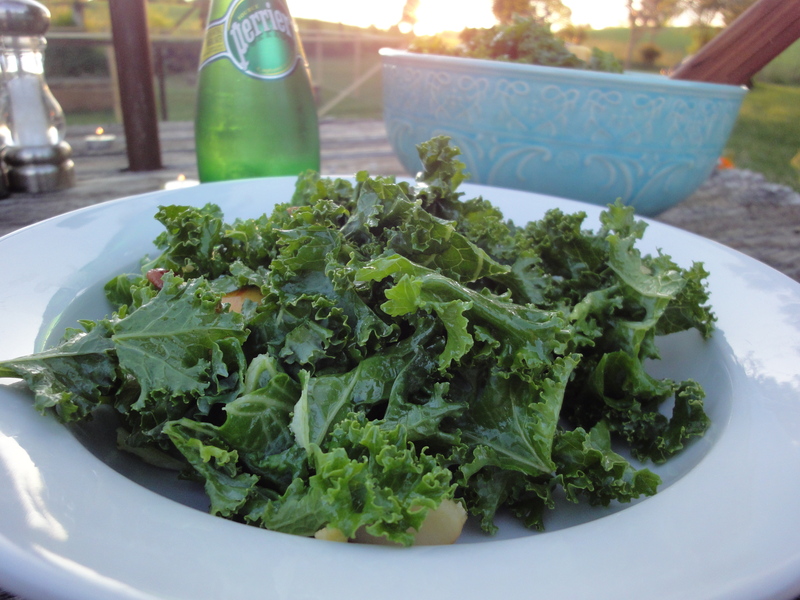 Benefits: As for the actual health benefits, I am by no means a nutrionalist but…Kale, a member of the brassica family (cabbage, broccoli, collards), is full of vitamin K, which is important for preventing bone fractures and bone loss (osteoporosis). It is also an excellent source of vitamin A, vitamin C , vitamin B6 and manganese, as well as a good source of dietary fiber, calcium, copper, and potassium. That is why kale is called a super food! Sesame is supposed to be high in calcium and also great for building strong teeth and bones and combating osteoporosis. Sesame seeds contain sesamin and sesamolin (which are supposed to prevent the development and growth of certain cancer cells), magnesium, and vitamin E (strengthens nervous system and promotes good digestive health). Ginger has been used for ages as a natural remedy for nausea, reducing inflammation, and stimulating digestion. It is also said to provide migraine and menstrual relief as well as is a mood enhancer and helps relieve stress. Garlic is known for its antibiotic properties. Garlic seems to be the cure all for so many things or at least aid in the treatment…blood pressure, cancer, colds, heart disease, infections. Know that you are doing good to your body with what you are eating.